Like many of you, I was shocked to hear about the sudden passing of legendary television icon Alan Thicke, who starred in the sitcom Growing Pains and on Netflix's reboot Fuller House, among other roles. At age 69, a ruptured aorta took his life suddenly in mid-December while playing hockey with his 19-year-old son, Carter. He was rushed to Providence Saint Joseph Medical Center in Burbank, California, where he was pronounced dead. Shortly after, actress Carrie Fisher, loved by millions as Princess Leia in the Star Wars movie franchise, died after suffering a heart attack on a flight from London to Los Angeles. It's always a shock when someone unexpectedly dies from a heart attack, stroke, or any other form of heart disease—especially if you just saw the person a few days before in seemingly perfect health. This was the case concerning Thicke, based on news reports. I say "seemingly perfect health" because we don't know the condition of Thicke's health that may have caused his aorta to rupture. Maybe he had hypertension, high cholesterol, or a congenital heart abnormality. Whatever the cause, both Thicke's and Fisher's unexpected deaths remind us that heart disease continues to be the number one killer of men and women in this country. Unless you're a dietitian specializing in cardiac care, you may be unaware of the high-sensitivity troponin blood test that, according to a study published in a December 2016 issue of the Journal of the American College of Cardiology, could be used to predict whether a healthy person without signs or symptoms of heart disease is at high risk of a heart attack later in life. The high-sensitivity test, which looks for levels of the protein troponin released when the heart muscle is damaged, is approved for use in the United Kingdom but not in the United States. However, US medical experts are hoping the FDA approves these high-sensitivity tests soon so they can better detect lower thresholds of troponin in patients and administer earlier treatment. This would be a huge step forward in our fight against heart disease, as more lives like Thicke's and Fisher's could be spared. In the study, researchers measured the troponin levels in 3,300 men who had high cholesterol but no history of heart disease. Men who had higher blood levels of troponin were more likely to have a heart attack or die of heart disease up to 15 years later. However, placing some of these men on statins reduced risk and troponin levels. In the future, the researchers plan to conduct additional studies involving women. 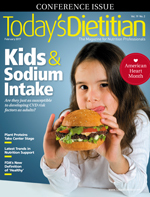 Because heart disease is such an important medical issue, this month Today's Dietitian is featuring an article on children and high sodium intake that includes strategies for counseling parents to lower consumption. Also in this issue are articles on plant protein quality, enteral and parenteral nutrition, and a comprehensive guide to insurance reimbursement. Please enjoy the issue!